Make hay while the sun shines. I do love a proverb, I recall being very taken with them when at school and my own mothering is peppered with sage proverbial lines which make my rather too sceptical children chuckle aloud. Today there was simply no question of any actual hay making for the rain has been incessant. I was forced to abandon my plans of garden tidying and laundry drying and give myself up to the elements. 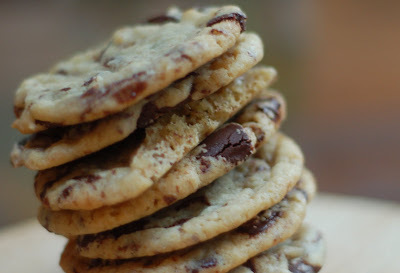 For really there can just one sensible course of action when the rain comes tumbling down and that is to retreat to a warm steamy kitchen and make chocolate chip cookies; while the skies, they pour. Oh your chocolate chip cookies look divine! Could you possibly pass along the recipe? I've been in search of the perfect CCC for so long now. I'm thinking I might move in and hope that it rains every day. Oh, those look so delicious. Wish I had a least a half dozen to stuff in my mouth right now! Seriously!!! We are being deluged by rain here, so I will take your advice!!! Yummy!!! It seems as if it is raining everywhere! These look so good. I have to make another batch. The one I made two days ago is long gone! I like your chocolatey pragmatism. Could I scrounge the recipe please?